To help preserve what is significant to my consciousness, I turn to photography - film photography in particular. Although I am an individual that is excited by innovation, I also value tradition and craft. This is one of the reasons why film photography resonates with me and that I have chosen it as the art form through which to share my visual journey. I hope that you will join. 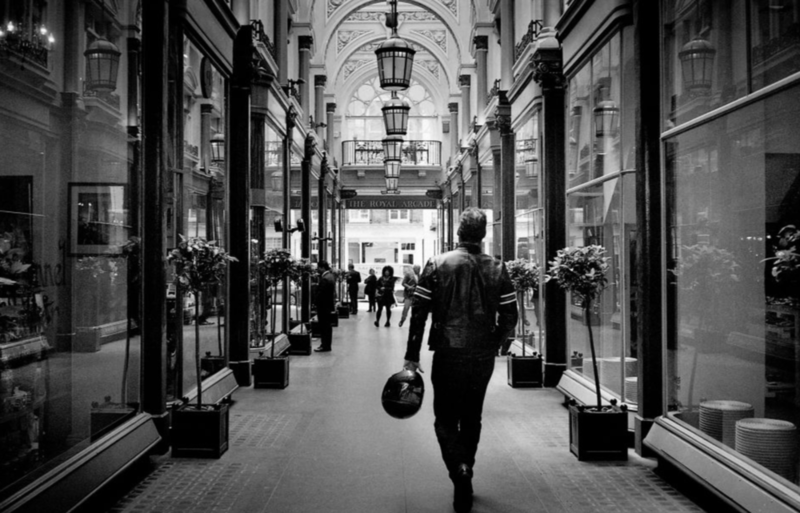 Biker on the Royal Arcade, Bond Street, London, England (18th June 2012) // Minolta Hi-Matic AF2, Ilford XP2 400, Epson V330. I've always been interested in combining opposites - old with new, east with west, heritage with innovation. I enjoyed the perspective in this moment: both the perspective of looking down the Royal Arcade and the perspective of how well the Royal Arcade, a Victorian shopping arcade built in 1879, related to the motorcyclists outfit. Young, Ragay, Camarines Sur, Philippines (Summer 2013) // Ilford HP5, Mamiya ZE-2, Epson V330 // When we create, me must preserve what is most precious about the human experience, the essence of the childhood spirit — connection, fun and joy. If we do not create for this purpose, why are we creating at all? Motorcycles on Berkeley Square, Mayfair, London, England (Summer 2012) // Kodak T-Max 100, Zorki-4, Epson V330 // Technology meets heritage yet again. How should we blend them? Can we retain the integrity of something beautiful and old whilst moving into the future? Unity and celebration for the London Olympics, King's Cross St Pancras Station, London, England. (July 20th 2012) // Minolta Hi-matic AF2, Ilford XP2 400, Epson V330. // The only time of year when the British public spoke to one another on public transport, the 2016 Olympics. STOP - the power of the sign, Vienna, Austria. (April 19th 2013) // Olympus Om-2n, Neopan 400, Epson V330 // Signage is fascinating because there is almost a universal language to it. Even if we removed the words 'stop' the shape of the sign alone says 'stop.' Signs and symbols are unifying and unity is beautiful. Just relax, Vienna airport, (Austria 2013) // Kodak T-Max 100, Olympus OM2n, Epson V330 // The joy and pain of business. One of the greatest things about working internationally is being exposed to different cultures, different ways of seeing, being. One of the pains of working internationally is that there is always more to catch up on. There is always more to do and there is always one more flight to catch. This lack of rootedness can take its toll on even the most adventurous of individuals. Does home become more significant when we are away? Do we feel a greater need to close the deal and get back to our loved ones when the place we come back to is not our home but a hotel room? And as creators how can make objects, spaces and interactions that feel like a home away from home. The maturity of love, Vienna, Austria (April 2013) // Kodak T-Max 400, Olympus Om-2n, Epson V330 // As human our love for our partners, family and friends change over time. Sometimes this love lasts for a lifetime. Other times the love fades. When we create we must create so that the product, service or experience lives a lifetime of love with a person, even if it is as a memory. We fondly remember our favourite scent, the creation of a masterful event or meal and we hold onto items that hold memories, act as a facilitator to bring joy and pleasure into our lives, or have adapted to who we are as we change. Just waiting, Vienna, Austria (19th April 2013) // Mamiya ZE-2 , Kodak T-Max 400, Epson V330 // There's a lot of waiting in life. Waiting for the bus, tram, train or taxi. Once we are on a mode of transport, we wait for the journey to end. We wait for the right person to come along. We wait for the rain to stop. We wait for results. We wait for the traffic to pass. We wait for paint to dry. We wait for for the supermarket queue to progress. Why do we spend so much time waiting? How can waiting time be used to enrich our experience of life? View of St Paul's Cathedral from the Millennium Bridge, London, England (Summer 2013) // Fuji Neopan Acros 100, Olympus OM-2n, Epsom V330 // I can't help but be moved by the view of St Paul's Cathedral constructed in 1675 whilst stood on 'Millennium Bridge', a 'swinging bridge' that opened in 2000. It is amazing how the British landscape has evolved over the past 500 years. How do we preserve awe inspiring heritage whilst creating awe inspiring, socially relevant innovation? There is beauty both in the past and in the future. Hotel Astoria, Vienna, Austria. (19th June 2013) // Mamiya ZE-2, Kodak T-Max 400, Epson V330// I have always been fascinated by hotels, an environment that combines history, heritage and sets the stage for guests to tell a story. Reading 'out of home', Notting Hill Gate, London, England (Summer 2012) // Kodak T- Max 100, Zorki - 4, Epsom V330 // Sometimes you just need space that your home cannot provide for you. Sometimes you want noise. Sometimes you want to watch the people walk by or eaves drop on a conversation at the end of a newspaper. And sometimes the confines of your personal living space cannot fulfil all your needs. What better location than outside tube station? Burnt grass, West Sussex, London, England (Summer 2104) // Kodak Portra 160, Olympus Om-2n, Epson V330 // Regeneration is nature's natural ability, if we don't interfere with it. Here is a simple example of some burnt grass in the English countryside. What once was green is now brown and will restore itself back to green again. A cigar whilst I wait for my wife, New Bond Street, London, England (Summer 2012) // Ilford XP2 400, Minolta Himatic // Waiting can be beautiful. East Sussex, England (Summer 2014)// Kodak Portra 160, Olympus OM-2n, Epson V330 //It is in moments like this that I reflect on the wealth of knowledge that nature has to teach us. Are we able to capture the tranquility of the countryside when we build a hotel, a school or a hospital? Can we build around the essence of relaxation whilst building systems where waste does not exist? I believe it is fully possible. A Portrait of Play, Stanley Innocent Junior, at home in London, England (Spring 2014) // I have been lucky to watch the evolution of this young man's playfulness. His signature essence is 'playfulness,' as is most children, but its playfulness in his own signature style. A character often quelled by the time a person becomes a teenager and extinguished into adulthood, I hope that he holds tight onto just how charming playfulness is - always asking for too much food, an insatiable curiosity and a fantastic ability to make everyone enjoy his singing and dancing. I look towards children not only because they highlight the importance of making without attaching to an outcome, but also because I am fascinated by the prospect of creating objects and spaces that bursts forth with that we lack in society today, play and vitality, the natural joie de vivre. I have a fervent belief that adult creativity can manifest outcomes that benefit the environment and the soul. Classic Black Taxi, Notting Hill, London, England (Summer 2012) // Kodak T- Max 100, Zorki - 4, Epsom V330 // The black cab is to London like the LV logo is to Louis Vuitton. A man meditating on the beauty of the Belvedere Palace, Vienna, Austria (April 19th 2013) //Olympus OM-2N, Fuji Neopan 400, Epson v330// I found this man admiring the Belvedere Palace really beautiful. His aloneness amongst the grandeur of this building made me think of the great capabilities of man to create beauty and how we can sometimes seem small in relation to the things that we have made. Resting, South Milton Street, London, England (Summer 2013) // Kodak T-Max 100, Zorki -4, Epsom V330 // I have forever been excited by derelict spaces - like a blank canvas that a new experience is going to be written on. The exciting thing about space is that there is a really opportunity to create a multi-sensory, memorable and transformative experience for guests when done really well. You can transport people to entirely different worlds. Moreover, the people who make the space are part of it. Crafting stories for spaces and thinking about how to make them memorable and immersive whilst integrating Chemistry, colour, shape and storytelling gets me super excited! Everyday experience, Supermarket Unknown, Vienna, Austria (Spring 2013) // Kodak Portra 400, Olympus Om-2n, Epson V330 // I cannot quite tell if she is stealing or reading the back of the packet but I do wonder how this simple experience of heading to the supermarket is going to change or rather how can we improve it? Can we make it waste free? Can we enhance the quality of interaction between people? Do we need to have tills? Kensington Perspective, London England // Kodak T-Max 100, Zorki -4, Epsom V330 (Summer 2013) // There's something fun about playing with perspective and patterns in photography. It makes for a cool way to think about print and structure. Schonbrunn Palace, Vienna, Austria (Spring 2013) // Ilford Delta 100, Olympus Om-2n, Epsom V330 // 3D Clouds. How can we create a deep experience of clouds indoors. Perhaps we can use lenticular printing? Perspective, Bruton Place, Mayfair, London (Summer 2013) // Kodak T- Max 100, Olympus Om2n, Epson V330 // Exploring the hidden streets of Mayfair. How can we find new within the old? Perspective and public spaces, Mayfair, London, England // Mamiya ZE-2, Kodak T-Max 400, Epson V330 // The importance of nature in the summer is more than just sun seeking. It gives a new context in which to connect with others - new activities and new sights shared. These are some of the experiences that bind people. Time to go, Vienna, Austria (Spring 2013) // Kodak T-Max 100, Mamiya Ze-2, Epson V330 // The best time to leave is when someone you love comes to get you. Field of Lavender, West Sussex, England (Summer 2013) // Kodak Portra 160, Olympus OM-2N, Epson V330 // A soothing sea of purple. Horse and Carriage, Schönbrunn Palace , Vienna, Austria (Spring 2013) // Schönbrunn Palace is a former Imperial summer residence in Vienna, Austria. Originally purchased in 1569 by Holy Roman Emperor Maximillian II as grounds for hunting game. In this moment, two tourists get off a horse and carriage tour around the the palace grounds. The horse and carriage being an excellent way to take people in the present to the past. Satisfaction, MAC Cosmetics, Selfridges, London, England (Summer 2012) // Ilford XP2 400, Minolta Hi-Matic, Epson V330// Seeing a piece of work, whether it is a house or a new look, come together integrates several emotions. If it is pleasing to you, we see joy, anticipation, peace. If it is displeasing we witness disappointment, fear and anxiety. In this image Agila was peacefully pleased at how well her new look was taking shape. What was interesting to see was that in order to create positive emotions whilst crafting her look, a constant dialogue took place between her and the make- up artist. Their work was not the work of one man but a conversation between two visionaries with Agila steering the direction of his expertise. To create a pleasant customer journey, not only do we require deep knowledge of what creates pleasure, but also deep knowledge of how to listen, even if the person is not speaking. Mastery by MAC (Summer 2012) // Ilford XP2 400, Minolta Himatic // What processes count as everyday art? Is what makes makeup so appealing less that something is being 'hidden' as some people feel but rather that it's a process that integrates creativity into life? Perhaps it's the process itself that adds joy to the individual and expert artists. Why do we not talk about that side of it? The simple art of sitting with your best friend, Vienna, Austria. // Mamiya ZE-2, Kodak T-Max 400, Epson V330// Just like 'Just Waiting' this man is also seemingly waiting, dog by his side. I think he is waiting beautifully. Tram, Vienna, Austria. (19th April 2016) // Mamiya ZE-2, Kodak T-Max 400, Epson V330. // Another variation on 'waiting.' There is something innocent about this moment that I wanted to preserve. The youth of the young man was something precious to me in that moment. Joie de vivre, Lola Ana, Godofredo Reyes Sr, Ragay, Camarines Sur, Philippines. (16th March 2013) // Mamiya ZE-2, Ilford Delta 100, Epson V330 // The ultimate purveyor of joy, my grandmother and her infectious laugh is an inspiration to keep focussed on life's priorities with joy as a base emotion and strength and integrity when life gives us challenges. Pineapple Plantation, Tagaytay, Philippines. (15th March 2015) // Mamiya ZE-2, Kodak Portra 160, Epson V330. // Pineapples are an exceptionally versatile crop. Not only are they delicious to eat, but they are also used in textiles, in the Philippine dress Barong. Pineapples have also been used in the manufacture of an organic leather, Pinatex, a sustainable replacement to cow leather. Adam and Leica, Bond Street, London. (15th March, 2015) // Minolta Himatic AF2, Kodak Portra 160, Epson V330. // Adam Lee is a dear friend and creative polymath, skilled in Biology, Music and Photography. He first introduced me to film photography in 2012 and it stuck as an artful way to record my observations. When you are surrounded by passionate, creative people, they can't help but infect you. On the lookout, Makati, Manila, Philippines (Summer 2013) // Kodak Portra 160, Mamiya ZE-2, Epson V330 // Keeping Manila, a city riddled with terrible traffic, moving is the mission of these men. Man built skyline - view from the Millennium Bridge, London, England (Summer 2013) // Kodak T-Max 100, Olympus OM-2n, Epson V330 // Once a blank piece of land, now home to diverse constructions including the Globe Theatre first opened in 1599 to the Shard designed by Renzo Piano, opened in 2013. I find cities fascinating and love this scene simply because we have so many of London's icons in one frame spanning almost 600 years of history. Tasting the Universe, Vienna, Austria (Spring 2013) // Fuji Neopan Acros 100, Olympus Om- 2n, Epson V330 // The most important aspect of creative work is its ability to illicit emotion. Despite the harsh winds, this individual was focussed and content in her simple task of sipping on Coke. How can we design more moments that look and feel like this? Soho Theatre, London, England (Summer 2013) // Fuji Neopan Acros, Olympus Om-2n, Epson V330 // I found the moment of two people walking in opposite directions to one man and a sign quite amusing. Although the sign is meant for traffic, the sense of tension of opposites makes me think of the joy and pain of those who go against the grain. Tourist Attraction, Vienna, Austria (Spring 2013) // Kodak T-max 100, Olympus OM2n, Epson V330 // The food truck, an icon since 1886. Charles Goodnight, a Texas cattle rancher, fitted a sturdy old United States Army wagon with interior shelving and drawers, and stocked it with kitchenware, food and medical supplies. Food consisted of dried beans, coffee, cornmeal, greasy cloth-wrapped bacon, salt pork, beef, usually dried or salted or smoked, and other easy to preserve food stuffs. The wagon was also stocked with a water barrel and a sling to kindle wood to heat and cook food. Crown of St. Pauls Cathedral, London, England (Spring 2013) // Kodak T-Max 100, Olympus Om2n, Epson V330 // Built to last. Built so well, its most recent refurbishment cost approximate £40 million. Musee du Louvre, Paris, France, 2013 // Olympus Om-2n, Kodak Portra 160, Epson V330 // As you can see at the far left at the back, a foreign couple do the ritual of making it look they are touching the top of the building. It makes me reflect on how much does a ritual make a place? How many of our rituals connect us to a tribe? 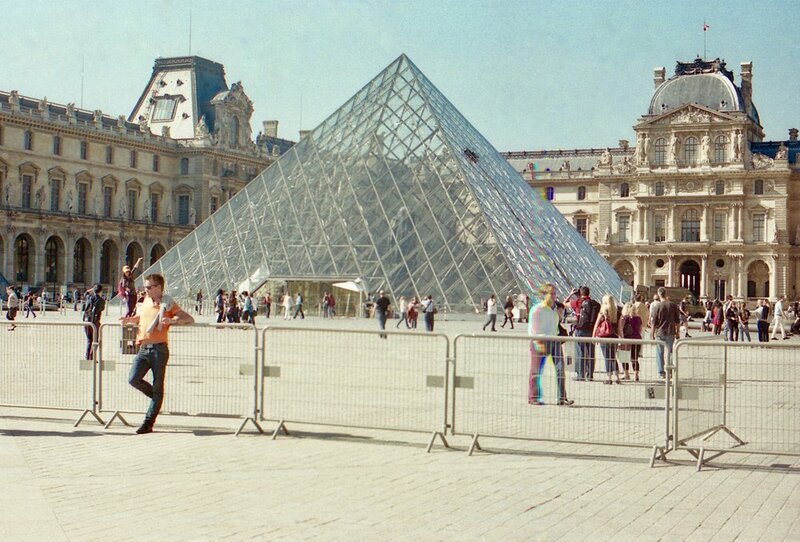 What else is behind people taking the same photo at a monument? Another accident which I quite like is the rainbow effect on one of the passers by. If only I could work out how to replicate that. Structure and safety, Makati, Manila, Philippines (Summer 2013) // Kodak Portra 160, Olympus Om-2n, Epson V330 // What role do humans have in the experience of safety? If we replace a human with a computer, do we feel as safe or as cared for? A March 2017 article in WIRED, Silicon Valley Would Rather Cure Death than Make Life Worth Living, explores the downside of our addiction to creating with technology. Perhaps then, our then we can shift our creative efforts into making with humans in mind, not for efficiency, but for cultivating and enriching life experience. Falun Dafa, Soho, London, England (Summer 2013) // Kodak Tri-X 400, Olympus OM-2n, Epson V330 // Falun Dafa is a Chinese practice that combines meditation and qigong exercises based on the values of truthfulness, forbearance and compassion. St. Paul Cathedral, London, England (Summer 2012) // Ilford HP5, Olympus Om-2n, Epson V330 // Can you feel the Olympic energy? Entertaining mascot contrasting the heritage and grandeur of St. Pauls Cathedral.